Welcome to our Tribal members and guests from the United States and Canada and everyone else who has chosen to attend our celebration. 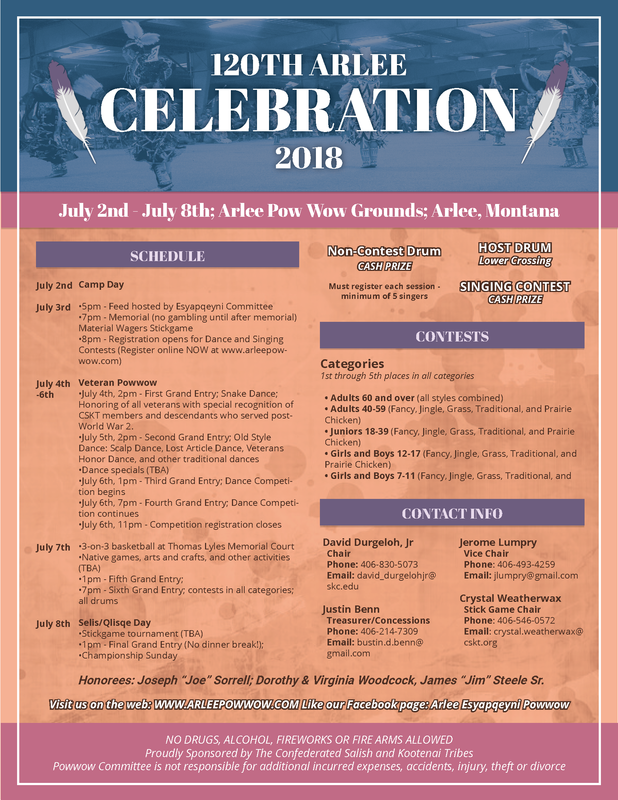 In the 1890s, traditional Indian dances were illegal under Bureau of Indian Affairs rules, and the Indian police and Flathead Indian Agent Peter Ronan used threats of U.S. Army intervention to break up the dance. They didn't find it illegal to celebrate the Fourth of July. The 2018 Celebration has ended, now planning for 2019 will begin! Stay tuned for updates. We would like to announce the 120th Arlee Celebration Committee meeting Friday, March 9th at 5p.m. in Arlee at the Senior Citizens Center (Brown Building next to Nkwusm). Snack provided (usually a ring of red and a loaf of bread with chips).